If the headline sounds like cheap sensationalism to gain attention, I plead guilty. However, like many news headlines it is misleading, but based on fact. 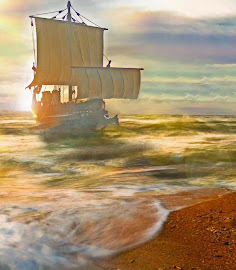 I am not going to claim that the Chinese were among the list of Pre-Columbian visitors to America. Last year a small part of the famed Terracotta Army that was uncovered in China was exhibited in Houston. It was a wonderful exhibit, well worth the 3-hour drive from Austin. But it was very small, featuring 50 or so of the best pieces and cameras were not allowed. On the return, my neighbor had the foresight to include a stop at an attraction called the Forbidden Gardens in Katy, Texas, which is very close to Houston. Forbidden Gardens is comprised of two exhibits: a 1/20 scale reproduction of the Forbidden City and a 1/3 reproduction of the tomb of the terracotta warriors. The Forbidden City is interesting, but the terracotta warrior exhibit is breathtaking. A wealthy Chinese importer, who immigrated to States, created the attraction to introduce a bit of China’s illustrious history and culture into America. He imported over 6,000 replicas of the warriors found in the famous tomb of Emperor Qin of China and recreated the site in detail. 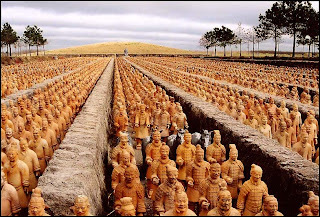 The real army was buried with the Emperor of Qin in about 209 BC. He is given credit with being the first emperor to unify China. Ironically, he may have died prematurely drinking potions to extend his life. As the Emperor aged, he desparately searched for and elixir that would make him immortal. When he died, he was certain he would be an Emperor in the next world and buried the army to help him rule in afterlife. His main tomb has not been excavated because of high mercury levels in the soil. Archaeologist think that he tried to recreate a small world inside his tomb that included oceans and rivers made of liquid mercury. If they ever manage to excavate the tomb, I sure it will be amazing. I know this sounds like an ad, but if you are into ancient things, and you are in the Houston area, drop by the Forbidden Gardens in Katy, you will not be disappointed.